The legal tensions are escalating between Zillow and News Corp.-owned Move Inc.
And with good reason. There’s a lot of money at stake. In its fourth quarter earnings report this week, Zillow’s profits fell short of expectations, after the Seattle online real estate company spent $8.1 million on an ongoing lawsuit with Rupert Murdoch’s News Corp., which in 2014 acquired Move Inc. In a SEC filing on Friday, Zillow said that legal costs related to the Move Inc. litigation mounted to $27.1 million last year. And those expenses are expected to go up in 2016, reaching an eye-popping $36 million. That’s a lot of coin for a suit that largely centers around one employee. The dispute is tied to former Move executive, Errol Samuelson, who was hired by Zillow in March 2014. Samuelson and Zillow were promptly sued by Move for allegedly hijacking trade secrets, with Sameulson sidelined in July 2014 from working at Zillow by a Washington State Superior Court Judge, a ban that was lifted last year. If the rivalry wasn’t nasty enough in the courts, some verbal barbs flew this week. In a Friday appearance on CNBC, Rascoff was asked how long the legal bills would hang over Zillow. “You’d have to ask Rupert Murdoch that question,” said Rascoff, referring to the News Corp. chairman. “Today on CNBC, Zillow CEO Spencer Rascoff accused Rupert Murdoch and News Corp of acting out of ‘desperation’ in filing a ‘vindictive’ lawsuit. But that litigation was filed by Move long before News Corp even owned the company, and it is based squarely on the merits of the case, not emotions. In Zillow’s own filings with the SEC, it has concluded there is a ‘reasonable possibility’ it will suffer a loss in this lawsuit. “This is a new process for everybody,” said Diane Evans, president of the American Land Title Association, an industry group for title insurers and settlement agents. “No one’s had practice at it.”The switch to the new forms has been in the works for more than a year and was originally scheduled to take effect on Aug. 1, but the changes were delayed until Oct. 3. The two-month breather has given mortgage software vendors additional time to make necessary changes, but there still may be problems. You can get up to speed on the new forms and rules by reading about themon the bureau’s website. Faced with a growing housing problem, Seattle leaders have unveiled an ambitious plan to create 6,000 affordable housing units in the next 10 years. In September, Mayor Ed Murray and Councilmember Mike O’Brien introduced what is being dubbed the “Grand Bargain,” a plan that tries to find common ground for both housing advocates and real estate developers while increasing the production of affordable homes. It’s a groundbreaking proposal at a time when many cities are looking for new ways to expand affordable housing production. There are two major components to the Grand Bargain. The first establishes the Affordable Housing Impact Mitigation Program (AHIMP), also known as a commercial linkage fee, that will help fund the construction of new affordable housing by requiring developers to pay a fee on every square foot of new commercial development. The fee will range from $5 to $17 per square foot, based on the size and the location of the development. The second part calls for Mandatory Inclusionary Housing (MIH) for new multifamily developments, requiring 5% to 8% of units to be affordable for residents earning up to 60% of the area median income (AMI) for 50 years. In 2015, 60% of the AMI is $37,680 for an individual and $53,760 for a family of four. As an alternative to on-site units, developers can pay a fee to construct new affordable housing off site. The proposals alone would be a tough sell, but there’s another important piece to the plan. “The Grand Bargain says what if we implement a mandatory inclusionary housing program but we do it in conjunction with a modest ‘up zone’ citywide,” says O’Brien. In other words, the city will look at increasing development capacity by allowing developers extra space or height in their buildings. This would give landowners some additional value in exchange for providing affordable housing. “Instead of the affordable housing advocates or the nonprofit housing providers on one side and the private development community on the other side ready to sue each other over the linkage fee, this agreement we believe will give us more affordable housing with the up zone, and the development community is supportive of it,” O’Brien says. The sweeping proposal stems from the work laid out by the Housing Affordability and Livability Agenda (HALA) Advisory Committee. Made up of 28 housing experts, activists, and community leaders, the committee recently met for 10 months to hash out specific recommendations. The HALA plan, which features a total of 65 recommendations, comes at a time when low- and middle-income families are struggling to find affordable housing in Seattle. More than 45,000 households in the city—one in six households—are spending more than half of their incomes on housing. In the very best of times, Seattle and its development partners have created about 800 affordable housing units in a year, says Faith Li Pettis, co-chair of HALA. A partner at the Pacifica Law Group, Pettis is a bond counsel familiar with affordable housing transactions. HALA needed to find a way to more than double the prior high-water mark to meet Murray’s call for 20,000 affordable housing units in the next 10 years. The Grand Bargain components—the commercial linkage fee and the mandatory inclusionary zoning— are estimated to add 6,000 affordable housing throughout the city over 10 years. Many jurisdictions that have mandatory inclusionary zoning have been able to produce units at 80% of the AMI, but the committee wanted to go deeper. As a result, the units that HALA expects to come out of the plan will be targeted at 60% of the AMI. Seattle has a strong track record of supporting affordable housing, including a housing levy that has been repeatedly passed by voters. Even with that, the area needed a new model to capture the number of units needed by residents, Pettis says. Despite the strides made by the HALA committee and city leaders, there’s still a long road ahead, admits O’Brien. In early September, he was hoping to pass a commercial linkage fee bill this fall. Officials will also work on the inclusionary zoning legislation, which is expected to take approximately six months. However, key zoning changes have to happen as part of the Grand Bargain, and to do that citywide would likely take about two years, estimates O’Brien. 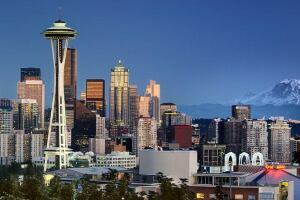 All eyes will be on Seattle during this time. Under the proposal, businesses could fully expense all new capital investments, an approach that seeks to remove taxes on marginal investment returns. This would simplify the tax code and significantly increase incentives to invest in new machines, equipment, buildings, and other structures. Now there are a host of devilish details that I would like to clarify about these proposals. For example there is that word “generally” which can cover a multitude of sins and what exactly does “new” mean? Is is it something I just bought for my business making it new to me or something that is really brandy new? Makes a big difference when you are talking about real estate. Also does the expensing apply to capital investments that would not be depreciable under current law such as land and does it apply to intangibles? If you poke around you will find that many economists approve of changes of this sort. A recent article in the Economist refers to the deduction for business interest as a “A Senseless Subsidy”. I’ve constructed a simple example to illustrate how the current system works and the effect that the change might have. My example sacrifices realism for easy math, but I think it shows the principles that are at work. Joe inherited a bit of land from his uncle and has decided to build some housing on it. The equity in the land allows him to take a mortgage to fund the construction cost – $275,000 (You can make it $2.75 million if that sounds too chintzy and scale the rest of the numbers up by a factor of 10). Joe expects the net operating income (NOI) to be $24,000. NOI is the rental income offset by the actual expenses of running the property including taxes, insurance and repairs, but not interest or depreciation. A more hip term in some circle is EBITDA. Joe has decided that he would really like his taxable income to match his cash flow. In order to achieve this he will pay $10,000 of principal on his mortgage each year for 27 years and $5,000 in the final year. Under that scenario cash flow after debt service and taxable income will be $250 in Year 1 gradually increasing til it reaches $24,000 after the mortgage is paid off. Joe will recover the principal payments through depreciation deductions. In real life, they would not match on a year to year basis, but they will ultimately line up. Over the 28 years in my simplistic scenario Joe would collect $672,000 in net operating income, pay $196,000 in interest (at 5%), $275,000 in principal and have taxable income and pre-tax cash flow of $201,000. Under the Bush plan, things are different. Joe gets to immediately deduct the entire $275,000 which is really cool if he has a lot of other income to shelter, but not so great if he doesn’t. It would however turn into a net operating loss, which he would probably get to mostly deduct over the next several years. Conceivably that could shelter Joe’s net operating income for the first twelve years or so. It gets hard after that though, since neither the interest nor the principal is deductible. Over the life of the scenario Joe has $672,000 in NOI and an upfront deduction of $275,000 for total taxable income of $397,000 and the same pre-tax cash flow of $201,000. A much more disturbing thought, one for which I will not try to construct examples is what happens with firms that borrow to finance receivables, inventories and to deal with irregular cash flow. During periods in which inventory and receivables are stable there might be a pretty good match between taxable income and after-tax cash flow. The notion that you could run into a rough patch during which there is barely enough operating income to cover your interest expense, but you are still generating taxable income because the interest is not deductible is frightening. Bush’s plan eliminates the deduction for state and local taxes. With the local taxes goes one of the subsidies to home ownership. The other, the home mortgage interest deduction is not directly attacked, but there is an indirect assault. Itemized deductions other than charity are subject to a cap. The cap would limit the tax value of itemized deductions to two percent of a filer’s adjusted gross income. Since it is dependent on a progressive tax schedule, a filer in a lower bracket will be able to have more deductions as a share of their incomes. Low- and middle- income filers in the 10 percent tax bracket could deduct up to 20 percent of their income, while high-income filers in the top bracket could only deduct about 7 percent. Someone with the maximum deductible mortgage balance of $1.1 million might be paying between $40,000 and $50,0000. If their adjusted gross income is $400,000 the cap would limit them to about $28,000 total non-charitable deductions. If they have large medical bills or gambling losses, there might be no benefit at all from the mortgage interest. Both homes and condominiums saw prices rise in August at the fastest 12-month pace seen this year, according to data released Thursday. The path to homeownership for Dominick Pham and Sarah Cheung was short. Two blocks, actually. 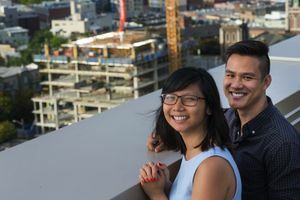 The engaged couple, Maryland transplants in their late 20s, had forked out rent for two years at a new, luxury apartment tower on First Hill. This summer, they noticed the Luma condominiums being built nearby and jumped at the chance to buy a one-bedroom unit on the lower floors. Across the region, home prices are zooming skyward, driven by new buyers like Pham and Cheung, a record-low inventory and expectations of higher interest rates. In August, the median price of single-family homes in King County was $499,950, 14 percent higher than a year ago. Condos fetched a median $299,250, a 20 percent gain over last year, according to the Northwest Multiple Listing Service. In both, the gains were the biggest 12-month jump seen so far this year. The biggest jump occurred in Seattle, where the median single-family-home price was $575,000, a 15 percent annual gain, and median condo price was $395,000, 32 percent more than a year ago. A big factor in the soaring Seattle condo prices is the handful of new downtown projects, where units can cost $600,000 or more. In Snohomish County, August’s median single-family home price was $366,825, or 11 percent higher over the year; in Pierce, $255,000, up 6 percent; and in Kitsap, $259,975, or 6 percent higher. In the four-county region, there were 7,792 pending sales — mutually agreed sales contracts that haven’t closed yet — the highest level for August since 2005, the MLS said. Savvy homeowners find ways to cut remodeling costs | Design Decor | The Seattle Times.